The newish Mumford & Sons is pretty awesome. Saw them a couple of weeks ago and can't stop listening to Delta. Blondie - first six albums remastered. The new 1975 and Imagine Dragons (my kids) albums. Best ofs - Michael Bolton, Mariah Carey and Destiny's Child. This week, I have been mostly listening to ELO and Jeff Lynne's solo work. Life's Good and horrie hastings like this. Got over 300 cover songs, man is amazing! This group of Russians do some great covers of some big hits. 2 of of my favourites here - I love the originals but it's good to see a big band really belt them out. This was a chance find on Youtube, not everyone's cup of tea but as someone who spends some time alone in a room strumming away on my guitar I find this a bit of an inspiration to try some new / different chords and maybe come up with a tune or two of my own. Unlike me though this guy has both talent and quite a sweet voice. 4 worthy tunes, I like the 3rd song a lot. If you play a bit of guitar his chords and rhythms are quite easy to pick up. I find listening to Jeff Lynne and ELO so soothing, been playing Alone In The Universe a lot and often put on Long Wave and Arm Chair Theatre. Have been playing Balance Of Power a bit too, i find it a very interesting ELO album. Had this one on repeat hopefully it won't be another 10 year wait for the next album. Listening to a bit of Kris Kristofferson. The raspy voice that accompanies his lyrics brings his storytelling to life. A bit of a favourite. kit66, Willie Ray and horrie hastings like this. CD? Last century's technology. or at least the last 17 or so years of it. Lasted longer than the floppy disk, but only just. Hands up everyone who spent a fortune on the bloody things buying music you already owned on vinyl, only to find them obsolete in a few short years. I've grown another thousand or so grey hairs since posting that. the one thing all those guys have in common is they've lived a life and know how to write about it. I only ever had the Bound For The Floor CD single - which gets an airing every once in a while via a 1997 playlist and an alt 90s playlist. 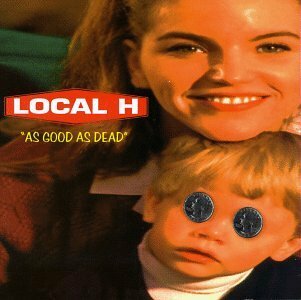 Everything by Local H is really good IMO, this one easily ranks as my favourite album of theirs check out the songs "Eddie Vedder" & "High Fivin' MF'er"
Missed these dudes out here recently as the tour sold out in a flash as usual....just so far above the pack when it comes to psych kinda stuff. First and last tracks the slight standouts.